(Photo Courtesy/Mike Beiermeister) Besser Elementary third graders observe microplastics through a microscope. Alpena, Mich. — The Thunder Bay National Marine Sanctuary was full of learning this afternoon. 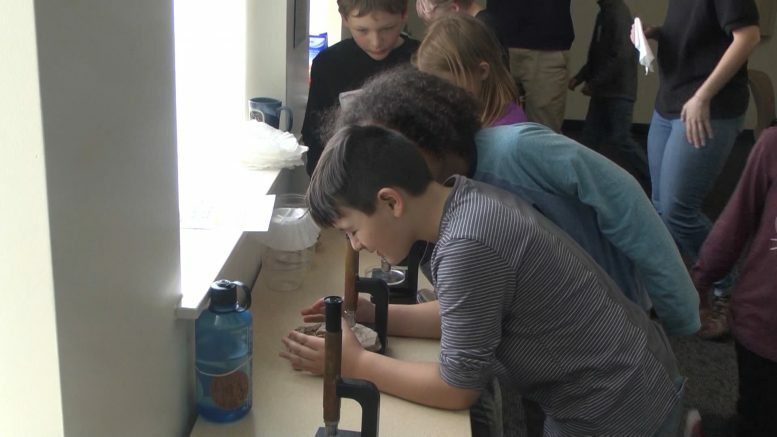 Third graders from Besser Elementary in Alpena received a crash course on marine debris. Students participated in engaging activities to get a better understanding of how waste affects our environment. Huron Pines AmeriCorps educational coordinator Adam Ziani breaks down the activities and what the children took away from the afternoon. The purpose of these activities are to introduce and expose children to human pollution to our waterways and in our environment. Studying bolus from an albatross shows children how human waste can affect the ecosystem. The recycling game taught students where to recycle certain materials in order to keep the environment safe. Educational field trips like the one today are put on by a number of community partners like the Northeast Michigan Great Lakes Stewardship Initiative, U.S. Fish & Wildlife, and the Thunder Bay National Marine Sanctuary.